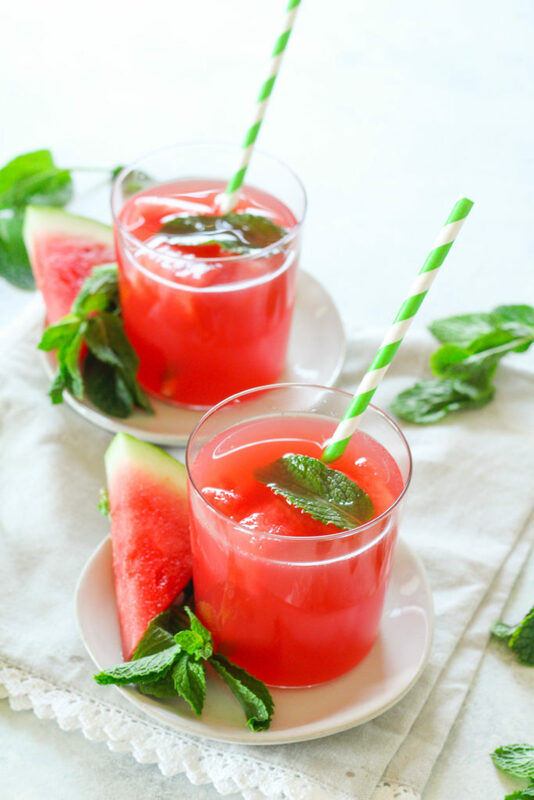 Watermelon Mint Sweet Tea is a refreshing upgrade from your regular tea routine! 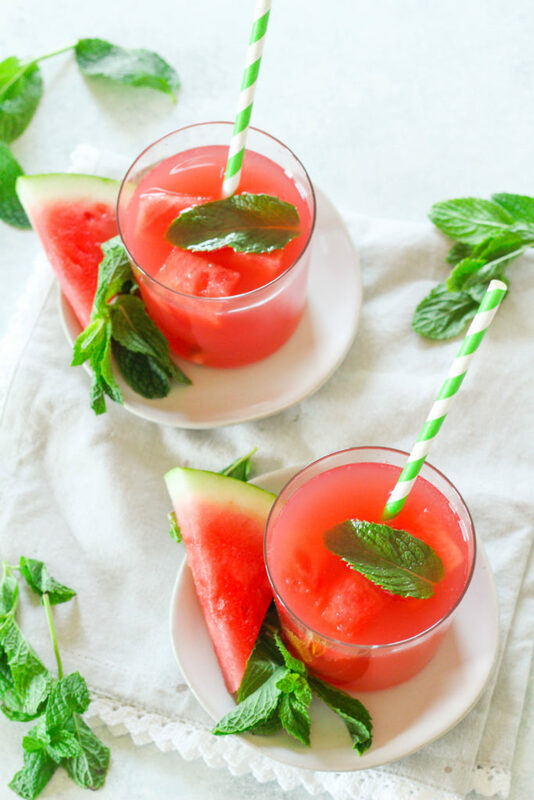 Watermelon puree is mixed with mint green tea and garnished with frozen watermelon cubes. Happy Monday, readers! 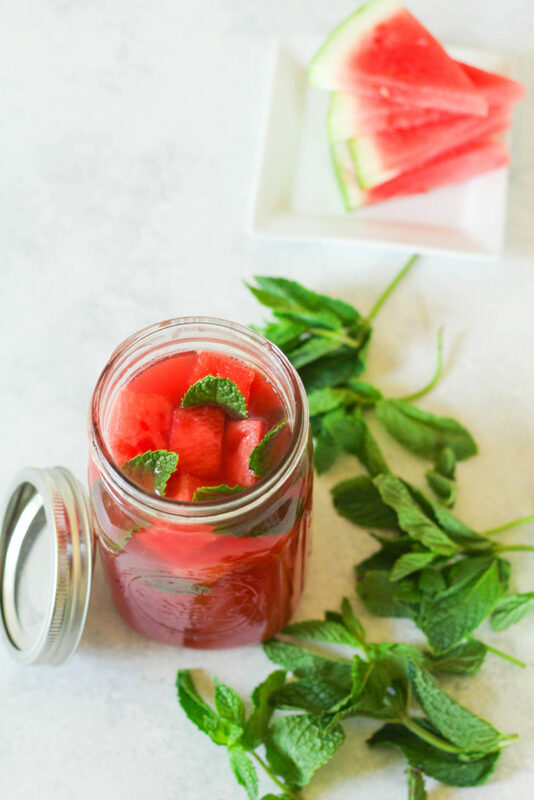 Today I’ve got a delicious Watermelon Mint Sweet Tea recipe that takes less than five minutes to put together. This tea is perfect for hot summer days where you need something refreshing. It’s been 110 degrees this weekend in Dallas, so you bet I’ve been drinking this tea to cool off. Watermelon is one of my favorite fruits, especially in the summer time. It’s so important to stay hydrated in the summer when it’s super hot. It’s easy to get dehydrated, even when you think you’re drinking lots of fluids. An easy way to stay hydrated is to eat plenty of foods that contain water, such as watermelon! Did you know that watermelon is 92% water? Perfect for hydration. Watermelon is a perfect ingredient for on-the-go meals and snacks! Watermelon is the best value in the produce section among fruit at only 17 cents per serving. 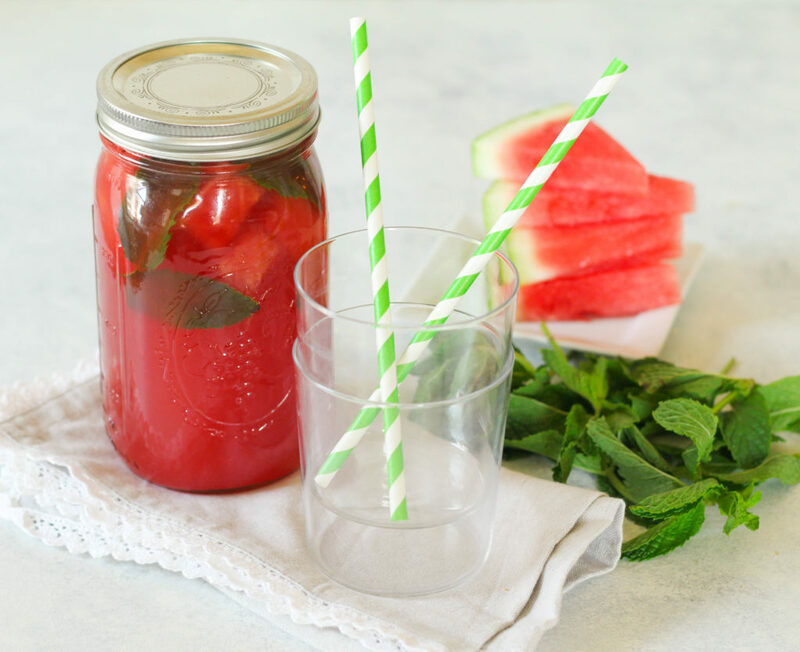 This watermelon mint sweet tea is perfect for taking on to go– for taking with you to the pool, on a picnic, or even to your kid’s sporting events on the hot weekends. I like to put this tea in a large mason jar , which makes it easily transportable. Once you get to your location (the pool, a picnic at the park), you can use plastic glasses to serve. This recipe makes enough for two 10-ounce servings of watermelon tea. The best part of this tea is the frozen watermelon ice cubes. 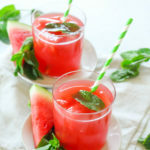 All you’ve got to do is freeze a handful of watermelon cubes a day before you’d like to make this drink, and it keeps your drink cool very well! And, you get to eat the cubes after you finish the drink. 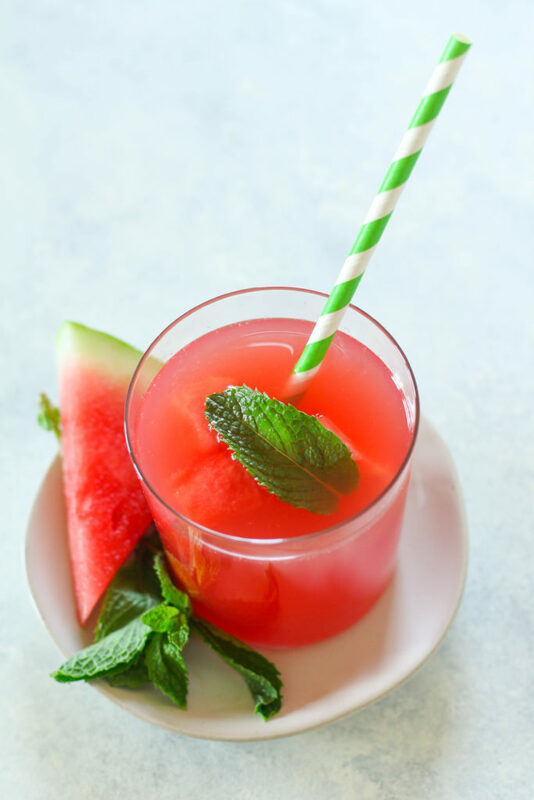 Freeze the half cup of watermelon a day before you want to make this drink. Puree the two cups of watermelon cubes in a blender. Use a strainer to strain out any seeds and pulp. Add the strained watermelon juice back to the blender. Pour in the green tea and run the blender on low to mix gently. Add the mixture to a large glass container. Garnish with mint leaves and the frozen watermelon cubes.